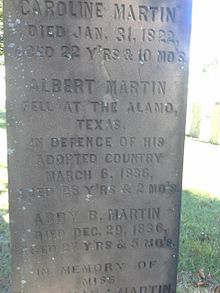 Three years ago, we shared this story about Albert Martin at the Alamo with you in Varnum News. 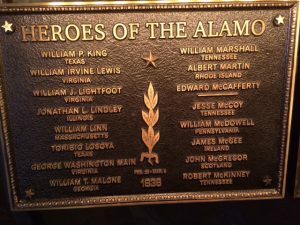 Now, there is a new piece of information that may have come about as a result of Rhode Island calling the attention of our friends in Texas to an error in their memorial to the fallen heroes of the Alamo. The update is at the end of this article. 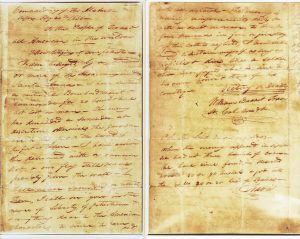 One of the most famous documents in American history, “To the People of Texas and All Americans in the World,” was written by Lt. Col. William B. Travis as a plea for reinforcements to defend the Alamo against Mexican forces during the Texas Revolution in 1836. Intimately connected with the letter is Albert Martin, born in 1808 in Providence, RI. Martin’s two grandfathers fought in the American Revolution and his fervent support of liberty was not surprising. After attending Norwich University in Vermont, he followed his father and brothers to Tennessee and later to New Orleans, eventually settling his family in Gonzales, Texas, in 1835. He opened a general store affiliated with the family business: Martin, Coffin & Company. TO THE PEOPLE OF TEXAS & ALL AMERICANS IN THE WORLD: Fellow citizens and compatriots – I am besieged by a thousand or more of the Mexicans under Santa Anna – I have sustained a continual Bombardment and cannonade for 24 hours & have not lost a man. The enemy has demanded surrender at discretion, otherwise the garrison are to be put to the sword, if the fort is taken – I have answered the demand with a cannon shot, & our flag still waves proudly from the walls. I shall never surrender or retreat. Then, I call on you in the name of Liberty, of patriotism & everything dear to the American character, to come to our aid, with all dispatch – The enemy is receiving reinforcements daily & will no doubt increase to three or four thousand in four or five days. If this call is neglected, I am determined to sustain myself as long as possible & die like a soldier who never forgets what is due to his own honor & that of his country – Victory or Death. P.S. The Lord is on our side – When the enemy appeared in sight we had not three bushels of corn – We have since found in deserted houses 80 or 90 bushels and got into the walls 20 or 30 head of Beeves. Smithers penned his own postscript to the letter and carried it on to Austin, TX. The letter was widely published, but it took some time for a large force to be assembled. Back in Gonzales, a small relief force of 32 men set out for the Alamo. Against his father’s wishes, Martin went with them and on March 1 made it back into the fortress. Five days later, Albert was among the 188 men killed in the Battle of the Alamo. In April 1836, an American army under General Sam Houston defeated Santa Anna at the Battle of San Jacinto. Martin’s body was never recovered. It was likely among those burned by the Mexicans who then scattered the ashes of the Alamo defenders. The original Travis letter survived and is now in the Texas State Library in Austin, where a copy is on public display. Among those who fell in the storming of the Alamo was Albert Martin, a native of Providence, Rhode Island and recently a citizen of this city … He had left the fortress and returned to his residence. In reply to the passionate entreaties of his father, who besought him not to rush into certain destruction, he said ‘this is no time for such considerations. I have passed my word to Colonel Travers, that I would return, nor can I forfeit a pledge thus giv- en.’ Thus died Albert Martin, a not unapt illustration of New England heroism. He has left a family, and perhaps a Nation to lament his loss and he had bequeathed to that family an example of heroic and high-minded chivalry which can never be forgotten. In 2002, Albert Martin was inducted into the Rhode Island Heritage Hall of Fame. On the Martin family plot in Providence’s North Burial Ground, there is a cenotaph memorializing Albert. Now, here is the new ending to our story. Although a pamphlet distributed at the Alamo stated Martin was a Rhode Island native, a plaque at the memorial said he was from Tennessee (where the family had lived for a while before coming to Texas). Officials at the shrine had for a long time declined to correct the plaque since, in their view, “there are errors all over the place here and we cannot change them all.” Recently, my fellow historian, Christian McBurney, visited the Alamo was pleased to find that at long last the error has been corrected after complaints by Rhode Islanders. Albert Martin can now really rest in peace, formally recognized as a son of the Ocean State. The Varnum Memorial Armory Museum collection includes a US Model 1816, .69 caliber musket manufactured at the Springfield Armory in 1833 and several others made at the Federal arsenal in Harpers Ferry. This type would have been used by Texans at the Alamo and by the U.S. Army during the Mexican-American War. More 1816 models (675,000) were made than any other flintlock in U.S. history. Many were converted to percussion caps in the period leading up to the U.S. Civil War.